Scroll down the page to view cats ready for homing. The Adoption fee is to help cover the basic day-to-day care costs, which includes de-fleaing and worming. We also vaccinate, microchip, blood test (those at risk) and neuter (if old enough) the cats that we take in. the adoption fee, it would of course be most gratefully recieved. Thank you for deciding to adopt a Cats Protection cat. Contact us on 0345 3714 202 (Mon-Fri 8.30 am - 6 pm, Sat 9 am - 3 pm) adoptacat@angliacoastal.cats.org.uk or from the contact us page on this web site. We’ll be happy to answer any questions you might have, and recommend the cats or kittens we think might be suitable for you.Some of our cats may be perfectly at ease sharing a home with children or other animals, where others will need a quieter environment. Let us know what you are hoping to find so we can help to choose the right companion for you. Reserve your cat of choice. 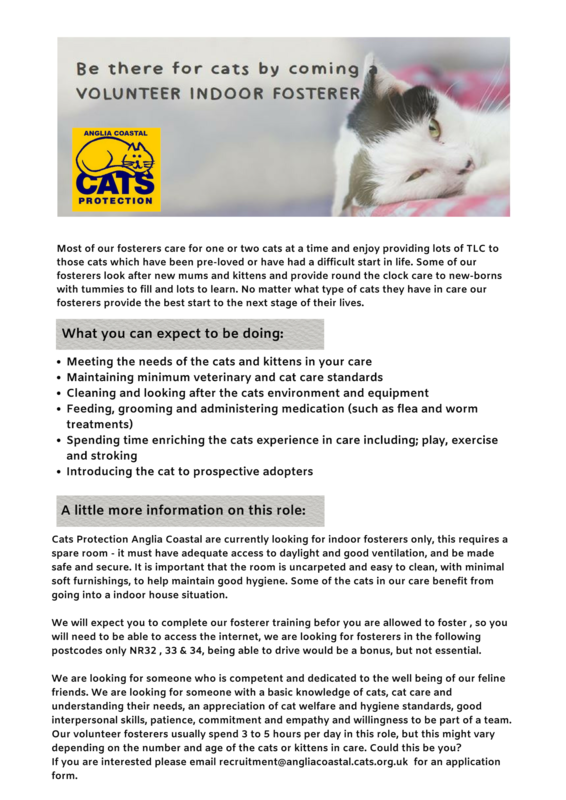 Before we can re-home the cat(s) to you we need to do a "Home Visit" this is to see if the cat would be suitable for your home and lifestyle, it also gives you a chance to ask questions on any aspect of cat care. If your home visit is successful, you can come and collect your cat. Just don’t forget to bring a good-sized, stable cat carrier with you. or questions please don't hesitate to get in touch.